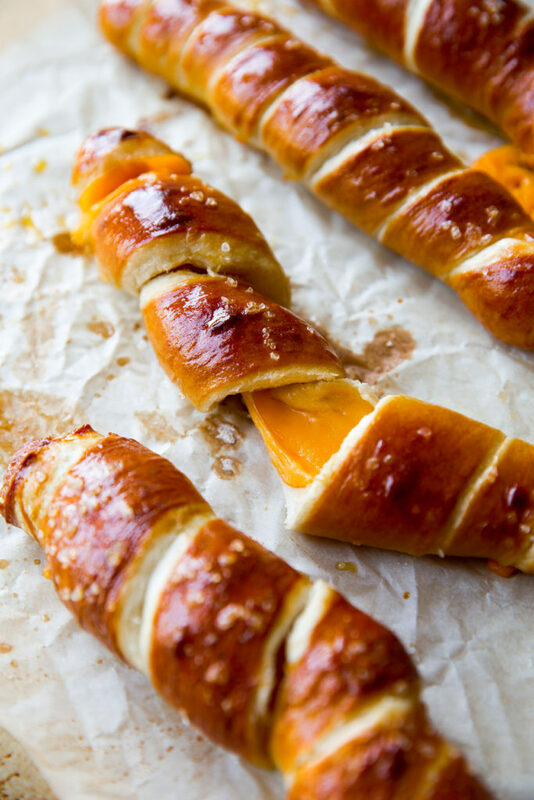 These cheesy pretzel twists are delicious from their hot, buttery, and golden exterior to all that glorious coarse salt and the melty cheese stuffed inside. What I particularly love about this family-favorite homemade pretzel recipe is that it’s quick. You don’t have to wait hours (or days!) for the dough to rise, rather just a few short minutes. You’ll only need 6 ingredients to get the dough started. 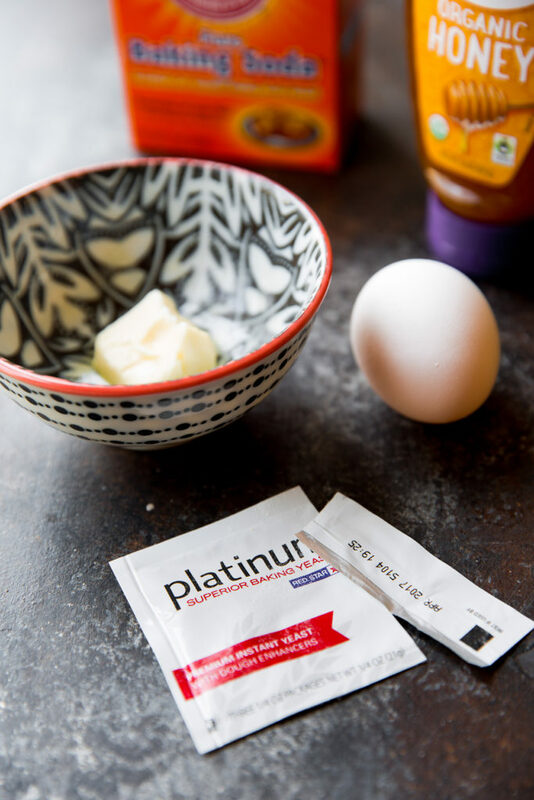 You’ll use my go-to yeast for nearly all the bread baking I do: Red Star Platinum Yeast. The reason I always recommend this yeast is because this is a premium instant yeast with a difference that not only you can taste, you can see as well. Your pretzels, your rolls, your breads, your pizza crusts– will puff up more. Makes working with yeast easy and your finished product absolutely fabulous. Once the dough is made, pull a little apart at a time, roll it into a log, then coil around a long piece of cheese. The baking soda bath is next. This is the step right before baking the pretzels and is definitely one of the most important. Here’s why: a quick dip into boiling water + baking soda is what gives your pretzels that wonderfully authentic golden brown color. Whether an after-school snack, football food, or a vegging out on the couch with all the carbs– these pretzel twists are the answer to all cravings. By the way, I think we can all firmly agree that no other snack can live up to melty cheese inside of a homemade pretzel!! 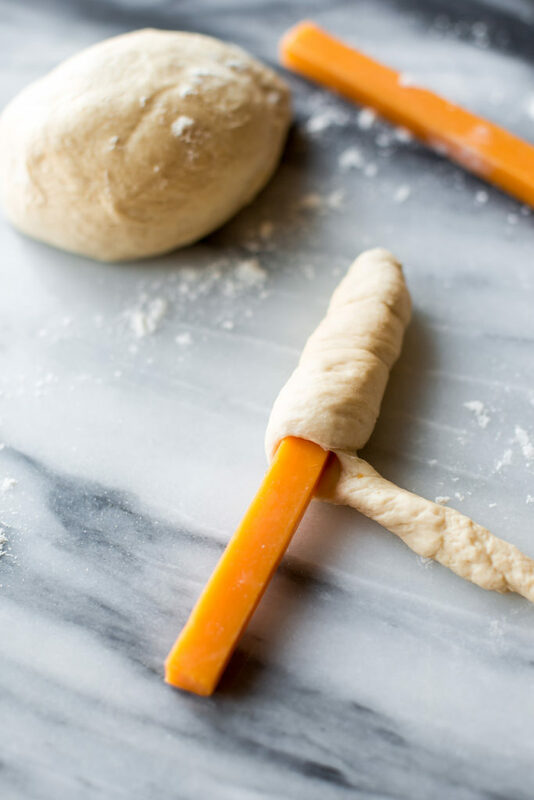 Simple homemade pretzel dough wrapped around cheddar cheese– so simple yet hit-the-spot delicious! Step 1. Whisk the yeast into the 1 and ½ cups warm water. Allow to sit for 1 minute. Some clusters of yeast may remain. Add honey and 1 Tablespoon melted butter (not warmer than 110-115°F). Whisk until fairly combined. Slowly add 3 cups of flour, 1 cup at a time, and salt. Mix with a wooden spoon (or dough hook attached to stand mixer) until dough is thick. Add ¾ cup more flour until the dough is no longer sticky. If it is still sticky, add up to ¼ cup more. Poke the dough with your finger – if it bounces back, it is ready for the next step. Step 2. Turn the dough out onto a lightly floured surface. Knead the dough for 3 minutes, then shape into a ball. Place in a large greased mixing bowl. Cover and let the dough rest in a warm area for about 10 minutes. Step 3. Preheat oven to 425°F (218°C). Line two large baking sheets with parchment paper. Set aside. Step 4. Cut off a handful of dough. Roll into an 18-inch log, about ¾ inch thick. Coil tightly around a cheese stick. You do not want any cheese to be exposed. Pinch to seal the edges. Repeat with the remaining cheese and dough. Step 5. Combine 9 cups of water with the baking soda in a large pot. Bring to a rapid boil. Drop 2-3 pretzel twists into boiling water and let sit for 20 seconds. Remove and place onto prepared baking sheet. Step 6. Brush beaten egg over each pretzel. Sprinkle with salt. Bake for 15-20 minutes or until golden brown. Step 7. Remove from the oven and brush each pretzel with remaining melted butter. Serve warm. Make ahead/Freezing: The prepared pretzel dough can be refrigerated for up to one day or frozen in an airtight container for three months. Thaw frozen dough in the refrigerator overnight. Refrigerated dough can be shaped into pretzel twists while still cold, but allow some extra time for the pretzels to puff up before the baking soda bath and baking. 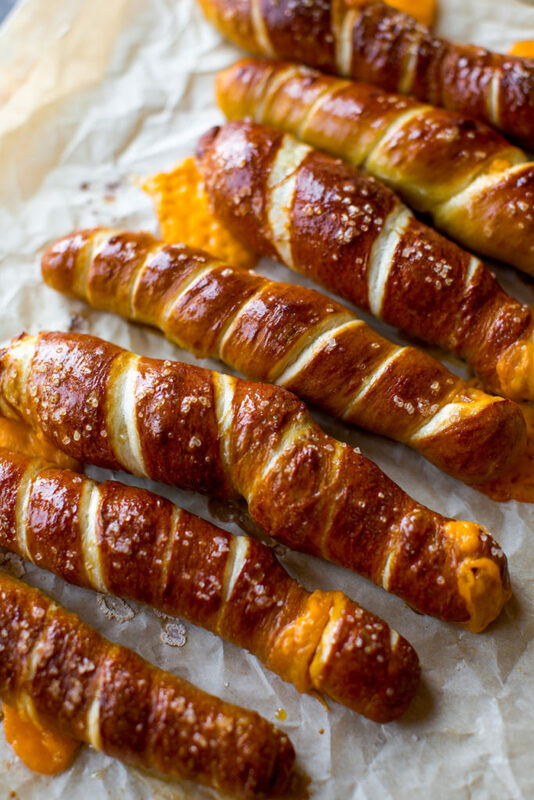 Baked pretzel twists freeze well for up to 3 months. Thaw and reheat in the oven at 300°F (149°C) until warm. Additional Notes: Cheese is bound to seep out a little, but to avoid a total cheese explosion– make sure you wrap the cheese up extremely tight. No cheese peeking out from under the dough! If the unused ball of dough rises a lot while you’re working on coiling the pretzels, make sure you punch it down to remove any air bubbles. I usually make them without sprinkling salt on top, they are still salty enough, and it’s better for your health :-)….yummy!! This looks like a great recipe to try with young cooks!